These are my favorite tools and equipment. Each item does contain affiliate links which means that if you click on them and/or buy something I may earn a small commission -at no extra cost to you. I only recommend the things I actually use in my kitchen. By clicking and buying these items, you help keep my recipe blog running. Thank you! and so far, so good. I buy extra bowls when I buy a new one now because those seem to be the thing that breaks when I break it. If I don’t buy extra bowls at the time I buy the processor then they don’t make them when I do need them. – These are a must have for my Crustless Chipotle Egg Cups. I still spray them with my Misto sprayer before filling them, but the egg cups come out so much easier and little clean up. Traditional muffin tins stick and take forever to clean up. – I previously owned a Breville Smart Oven which was great. When the air fryers came out a few years ago, I really wanted one, but I didn’t want another appliance on my counter and I didn’t want to store it. This year I discovered that Breville had a air fryer built into their new Smart Oven Air. I gave my old one away to a good home and replaced it with this one. It’s wonderful. I love to air fry the Crispy Egg Rolls in it, I can roast veggies, do toast, whatever my big oven can do, this one can too and it doesn’t heat up the house. 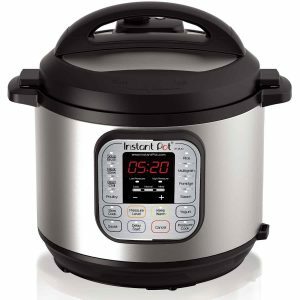 Instant Pot – This has quickly become one of my must have kitchen appliances. This is a rice cooker, slow cooker and pressure cooker all in one! If you use the pressure cooking setting you can make dishes in no time. I actually have two of them – the 6 quart Instant Pot – and because I do a lot of cooking and freezing I also have the 8 qt. Instant Pot I use them both regularly. 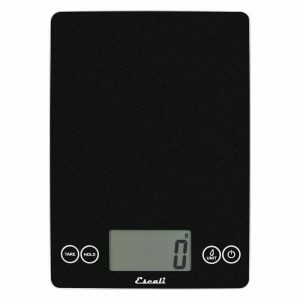 If you’re into Weight Watchers, you need a food scale. I use it every day, several times a day. Also perfect for weighing out dough (as in Homemade Slider Buns and Whole Wheat Pizza Dough) so each portion is the same to keep the points consistent. Any scale will do, but I prefer the flat kind. This Nutrimill Artiste Mixer is fabulous! The Super Pack includes a ton of attachments. Nutrimill Artiste Mixer – sister company to Bosch. This is my new favorite mixer! I loved my Kitchen Aid, but this Nutrimill Artiste Mixer beats it by far! It’s bigger, light weight, more powerful, and I love the open bowl design. – Since I make big batches and freeze most everything, mine is a 6 qt but this one works fine for most everyone. I have used this for so many years, but now am faithful to my new one, the Nutrimill Artiste Mixer. See above product for details. Again, I make big batches and freeze. This little baby helps keep everything fresh and portioned out. I write what it is on the outside of the bag, the date and the smart points when necessary. For instance, I buy a bag of slider buns or bread for my Turkey sliders, I will separate the buns into 4 in a package and freezer seal them up. When I’m ready to have one quick turkey slider, I de-thaw in microwave for 20 sec, then put in toaster oven to toast. The rest of the buns stay fresh in the freezer. – I go through quite a few of these so I don’t always buy the Food Saver brand. It’s nice to be able to order them in pint and quart size, those are the bags I use the most. Big Freezer in the Garage – This is essential if you’re making big batches to freeze. Many times I will, “flash freeze,” food such as Turkey Sliders, On the Go Crustless Chipotle Egg Cups, cookies for about 10 min then move them into food saver sealed bags. You need a freezer that has enough room to put 2 cookie sheets in there without having to rearrange your freezer every time you do it. I like the vertical or upright freezers better than the chest kind as it’s easier to find your food. Plus I’m only 5’3″ and I have a hard time leaning over the chest freezer to get things at the bottom. – This is a great grater for lemon/lime/orange zest as well as for ginger and garlic. 5″ Serrated Utility Knife– Mine are J. A. Henkels, my favorite one is the small serrated knife, I can do anything with that one. Kitchen Shears– Mine are J.A. Henkels. You can use them for just about anything in the kitchen from cutting open bags, to cutting pizza! 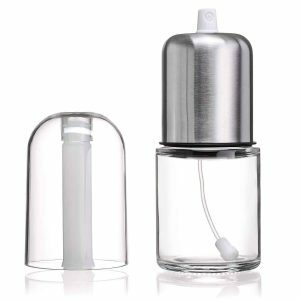 Premium Olive Oil Mister and Cooking Sprayer with Clog-Free Filter and Glass Bottle – This is a must for Weight Watchers, allows you to use “just a little,” without counting for points. Non Stick Skillets – Mine happen to be Calphalon but there are other great brands out there as well. This is also another must in my opinion for Weight Watchers as it allows you to cook with very little oil. Cast Iron Skillet -Great for fajitas! You can buy one already seasoned but continue to follow the directions for care. The more you use it, the more it becomes non-stick. Chainmail Scrubber This is the best way to clean your cast iron skillet. Super easy to use! 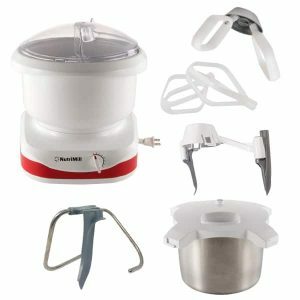 Garlic Rocker– I love using this garlic rocker, but I also use the food processor often if I need a lot of minced garlic. At least 3 Cutting Boards– I use often will use all 3 when I’m cooking-be sure to use a separate one for meat. I have quite a few of them in different sizes. I like this style best with the handle. 1/2 Size Baking Pans– 17 3/4 inches by 13 inches- You can also find them cheaper at Business Costco or restaurant supply stores. I use them for baking, for prepping the turkey burgers and putting them in the refrigerator, for flash freezing turkey burgers or anything else for that matter. I even have a few of the 1/4 size pans as well. 1/2 Size Parchment Sheets – Makes clean-up so easy, plus nothing sticks. I use these every day! Great for my Often you can find them restaurant supply stores in full pan sizes and just cut them in half, but you usually have to purchase a large quantity so buying on Amazon might be easier. Thermometer – Great for checking meat such as turkey when making Turkey Sliders and checking water temperature when making Slider Buns. Silicone Baster Brushes – Great for checking meat such as turkey when making Turkey Sliders and checking water temperature when making Slider Buns. Enther Meal Prep Containers [20 Pack] Single 1 Compartment with Lids, Food Storage Bento Box | BPA Free | Stackable | Reusable Lunch Boxes, Microwave/Dishwasher/Freezer Safe,Portion Control (28 oz)– These are great food prep containers! You can microwave them as well as freeze meals in them.